The groom is escorted to the badeken by his father and father-in-law (or whomever will be escorting him to the chupah). 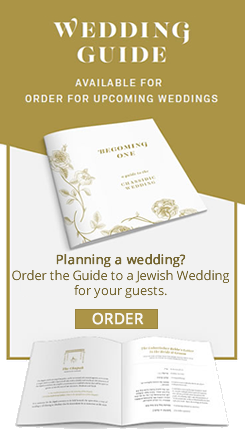 By Chabad weddings, the band plays the hauntingly solemn and holy melody composed by Rabbi Schneur Zalman of Liadi until the conclusion of the ceremony. After the groom veils the bride, the fathers and grandfathers of the bride and groom approach the bride and bless her. The groom's entourage then retreats from the room. The bride and groom proceed with their chupah preparations and everyone else continues to the site of the chupah. The fathers and grandfathers of the bride and groom approach the bride and bless herThe custom of covering the bride's face with a veil originated with our Matriarch Rebecca, who covered her face with a handkerchief when meeting her groom, Isaac. Technically speaking, there are several possible definitions for the legal term of "chupah,"3 According to certain opinions, "chupah" is accomplished through the groom "spreading his cloth" over the bride — which is accomplished by the badeken ceremony. The veil emphasizes that the groom is not solely interested in the bride's external beauty, which fades with time; but rather in her inner beauty which she will never lose. When the groom veils his bride, he is saying, "I will love, cherish and respect not only the 'you' which is revealed to me, but also those elements of your personality that are hidden from me. As I am bonding with you in marriage, I am committed to creating a space within me for the totality of your being — for all of you, all of the time." The veiling also symbolizes the bride's commitment from this moment on to reserve her beauty for her husband's eyes. 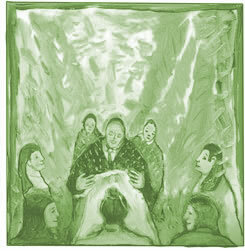 Chassidic custom is for the veil to be dense enough to completely obscure the bride's face. It also should not contain any silver or gold threads, as the bride and groom do not wear any jewelry to the chupah (see The Chupah). There is also a technical reason for the bride remaining veiled throughout the chupah ceremony. Ideally, the bride should not see the ring with which she is being married, lest she mistakenly under or overestimate its value, causing the "transaction" to be based on an erroneous assumption. Click here for more on this topic. Artwork by David Brook. David lives in Sydney, Australia, and has been selling his art since he was in high school. He is currently painting and doing web illustrations. Did You Marry for Beauty or Money? Tallit for the Ceremony I have a question about the tallit for the groom during the wedding ceremony. 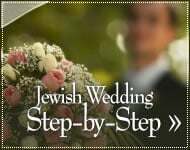 I am coming from a conservative/reform practice and I have seen some weddings were the groom wears the Tallit no, kittle, kittle no tallit, and no tallit no kittle. Finally, I attended a modern orthodox wedding, were the groom wore a kittle, and at a certain point wrapped him and his wife in the Tallit. I believe it was for the Sheva Brachot. blessing said by father of the groom to bride What blessing exactly does the father of the groom say to the bride when there is no father of the bride and the groom's father is the only father there?